The recent stock market weakness is making people nervous. If this includes you, heed this advice. 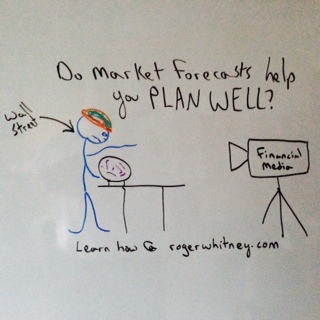 The LAST thing you should do is watch or read stock market forecasts. When the stock market plunged in 2008, it scared a lot of people. Since then these same people have been looking around every corner for the next stock market drop. That's one reason stock market forecasts are so popular. And it's usually the most extreme forecasts that get the most attention. Many investors think if they increase their understanding of how the stock market works, they'll make better decisions. They listen to a myriad of stock market gurus and pundits, equating a higher stock market acumen with a better return on their investment. The fact is Wall Street firms spend hundreds of millions of dollars and much of there intellectual capital "predicting" the future of the stock market and then marketing their "insights." Other than the fact that their predictions sell well, no one can predict something that is fundamentally unknowable. If you want to learn how, subscribe and I'll do my best to show you how. QUESTION: Do you have a consistent process for making investment decisions?